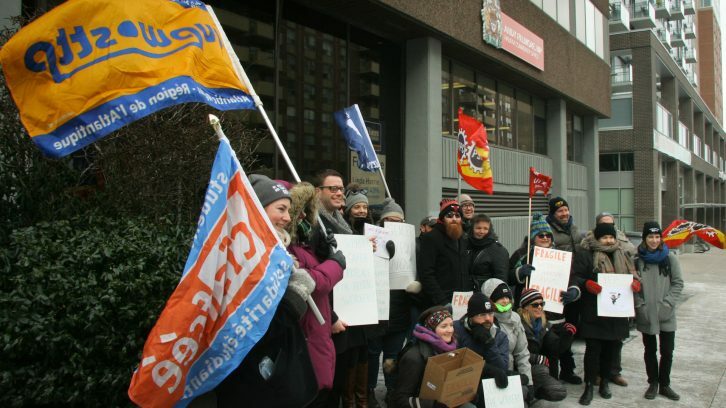 Demonstrators made a visit to Liberal MP Andy Fillmore’s Halifax office as they gathered in support of postal workers on Friday. “We’re here today to express our deep concern and dismay that this government has tabled back-to-work, strike-breaking legislation,” said Suzanne MacNeil, to staff at Fillmore’s office and a small crowd of supporters. Fillmore was not present. 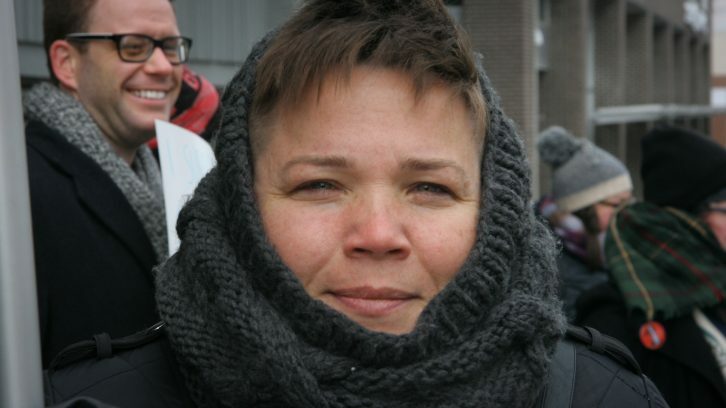 MacNeil, president of the Halifax and Dartmouth District Labour Council, helped organize the rally in response to a federal bill tabled Thursday by Labour Minister Patty Hajdu. The bill, which was being debated into the evening on Friday in the House of Commons, would force postal workers back to work. The Canadian Union of Postal Workers represents over 50,000 employees. 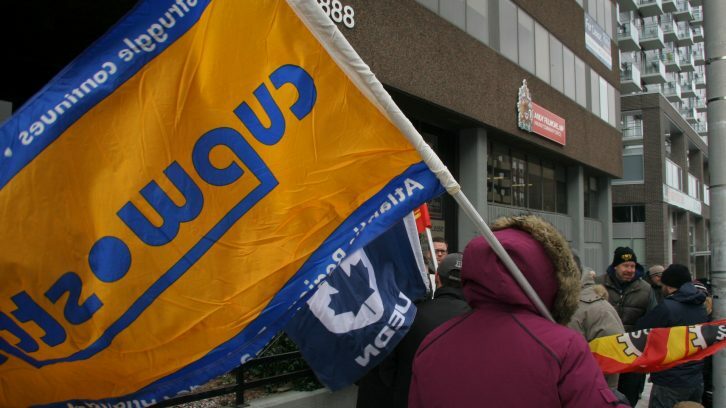 Members have been conducting rotating strikes across the country for the last five weeks, after contract negotiations between the CUPW and Canada Post failed. 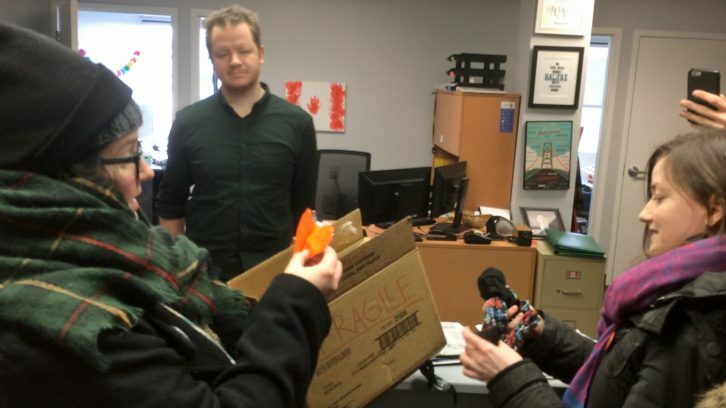 MacNeil and other demonstrators delivered a cardboard box filled with pieces of paper to Fillmore’s office labelled “fragile: workers’ charter rights.” On each piece of paper was written a demand in support of postal workers, including safer workplaces, meaningful collective bargaining and fair pay. As part of the demonstration, MacNeil read out loud each paper from the box to the cramped reception area. After, she asked staff to pass along the box and its contents to Fillmore. MacNeil said she wanted Fillmore to hear from those who support the collective bargaining process. “It’s important, especially for all Liberal MPs, to get the message that we oppose strike-breaking legislation,” said MacNeil. The demonstration began with a group of about 20 people outside Fillmore’s office. Many wore toques, jackets and pins with union affiliations, waved flags and carried signs with supportive slogans. Shaw appreciated Friday’s act of solidarity. Lori Walton, a member the Public Service Alliance of Canada, said any action against striking postal workers is an attack against all unions. “The labour movement is about strength of numbers and the strength of the collective,” she said. The rally was one of many co-ordinated actions across Canada in support of the CUPW. The last major dispute between Canada Post and the CUPW was in 2011. It resulted in the Conservative government passing a bill to end a lockout enacted by Canada Post. Due to the rotating strike, Canada Post’s website says customers should expect long and unpredictable delays, lasting into 2019.